Going to the Aiki Summer Retreat 2013! This summer, June 23-29, 2013, I’m going for the second time to the Aiki Summer Retreat, now at Feather River College, in Quincy, California (just east of Chico). It’s the kind of thing where you stay in the dorms, eat in the dining hall, sit by the river, and eat, breathe, and sleep Aikido for a whole week. Woohoo! I know a bunch of folks who have gone to this event in past yeast, both fellow students from Aikido of San Diego, and people I’ve met at seminars (and am looking forward to seeing again!). My teacher, Dave Goldberg Sensei, has gone many times, and says he’s never had a bad day there (besides, it’s a cheap vacation). If you are on the fence about going, hop down before you get splinters, and sign up! OK? Let’s get started. If you aren’t interested in any of the preparation stuff, don’t worry, there’s more. Keep scrolling to the part about what to do at camp. Arrange to visit with friends and family on the way up and back. Print a list of critical phone numbers and information, in case of phone failure. Instant coffee (little individual paper tubes are handy). Yes, there will be coffee at breakfast, but before you can get there you have to get up, get showered and dressed, and stumble over to the dining hall. The instant coffee can get you going until you get there, and can come in handy on the road, if you’re driving. Powdered Gatoraide (to put in water bottle). You can get this in packets that make 1 quart each. It’s much easier to pack than a case of bottles! Note that the packets are – at least at my local Walmart – not sold near the groceries! Instead they are with the camping and fitness gear. Spoon, fork, and knife (big enough for cutting up fruit). Remember, don’t try to carry a knife onto a plane. Trust me. Check it. Note that we will be staying in on-campus apartments, with kitchens, so the cooler may not be needed, and gel packs that need to go in the freezer should work. Generally when I travel, though, I bring two of the old-school cloth bag kind that you fill with ice cubes and water. These are great to keep in your dojo bag, because any convenience store or food service place can be a source of ice when you need it. Ice packs (for icing joints, etc.). If you are a dan-ranked sort of person, remember your yudansha book and hakama, too. I don’t have to worry about those yet! I don’t know if we will be doing weapons work at the Retreat. But here’s the info, just in case… If you are flying, you can make a tube out of plastic drain pipe or PVC, with two end caps, and check that. Tape the end-caps on with duct tape – the TSA will definitely want to open the tube and see what’s in there. Bring extra tape for the return trip. The historical weather stats for Quincy look awesome – average highs in the low 80s, average lows in the mid 40s. But… The records have been in the 100s and down in the 20s, so plan accordingly. Guys, you might want to skip the dress. Heck, I might even skip the dress. I just want to plan one outfit that would be appropriate if there’s a trip to an off-site sit-down restaurant or something. Some people like to dress up on Friday night. I’m probably going to be going casual. If you have something in mind to do, bring whatever you need. I didn’t bring or need anything in particular. I was able to cobble a “costume” of sorts together from my regular clothes, and slick my hair back with conditioner, and presto. Anything from a guitar to clown shoes might be handy. Use your imagination. A folding clothes/gi/towel drying rack (or plastic hangers, or travel clothesline) – thanks to seminar expert Geoff Yudien for that tip! Sheets & blanket – NOT necessary this time! Bloksberg Sensei has arranged for linens to be provided, so you don’t have to bring them. I think the campus may have some WiFi. I’ve heard it’s slow, but it should do the trick. I’m on AT&T… No idea what coverage is like there. That’s is so far. I’ll probably post some amendment, too. If you have any suggestions, especially if you’ve gone before, I’d love to hear them. See you there? I hope! Introduce yourself. Get involved. Don’t hang back. In 2011, as the only person attending from my dojo, and my first time there, I didn’t know how things would go. I assumed each dojo would do something they had prepared ahead of time for the Aiki Follies on Friday, and that I wouldn’t be participating. But the end of the first day’s training someone asked for anyone who would like to be part of an ensemble singing group. My hand shot up – and so should yours. I had a blast rehearsing throughout the week, and it was a great way to get to know people! Be respectful of the instructors’ time and privacy, of course, but don’t be afraid to approach them. Say hello. Invite them to sit at your table at a meal, or ask if you may join them. Join in the conversations that spontaneously pop up here and there. They have come to teach and share Aikido! Show your appreciation and interest. One high-ranking person I spoke with was disappointed that people were not asking more questions or engaging him in discussions – he’d come all that way to be available, and students were not taking advantage of the opportunity! I got to sit and chat with him for a good part of the evening. Lucky me! Read this. 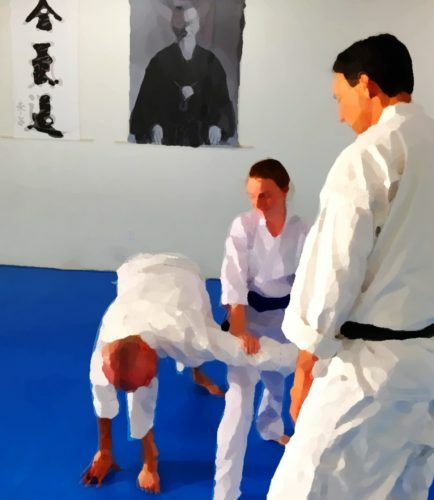 This is great advice from one of my favorite Aikido people, George Ledyard Sensei – his blog post from just a few weeks ago: How to Get the Most Out of Attending Aikido Camp. People dress in their rooms and walk to the dojo in their gi. So you don’t need a dojo bag – you won’t be changing in a locker room. That was a surprise to me the first time. It’s OK to not train in every class. I’m one of those stubborn people who tries to do it all, but you don’t have to! It’s totally OK to take a nap under a tree, sit off the mat and watch, or even go into town if you just need a break.